Zoltan Sylvester wrote a nice post a couple weeks ago exploring grain settling equations. He plotted up these equations using some Python code. Here, I simply reproduce what Zoltan did but with R code. So, go read Zoltan’s post first. This was more of an exercise in continuing to learn R rather than an exploration of grain settling physics. And, in this case, doing the ‘translation’ is a nice introduction to how Python works. My R code works (yay), but seems bulky and cumbersome (boo). I’m sure there are ways to streamline it, feel free to comment with suggestions. This first box of code defines constants, the three equations to be plotted, and then applies those equations to a range of particle sizes (diameters from 0 to 0.5 mm). This next box then creates the plot shown below the code. 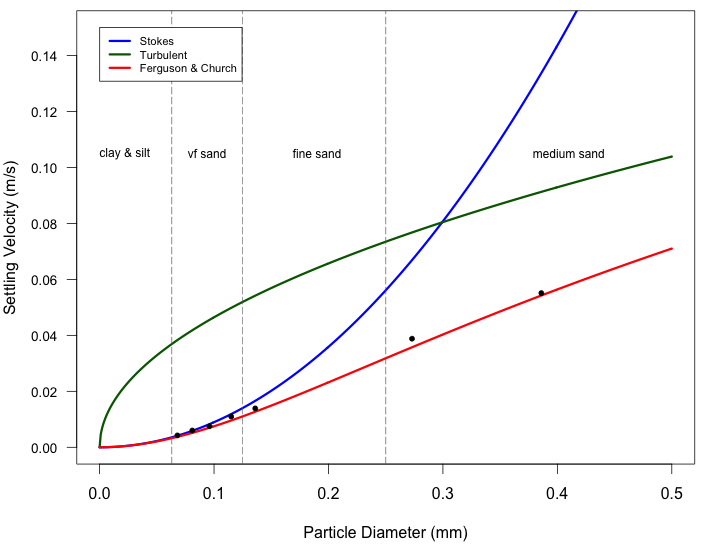 The next part is the same equations but for an expanded range of particle diameters (up to pebbles) and plotted in log-log space. Comparing Zoltan’s Python code to my R code is a great way to see how each language works. 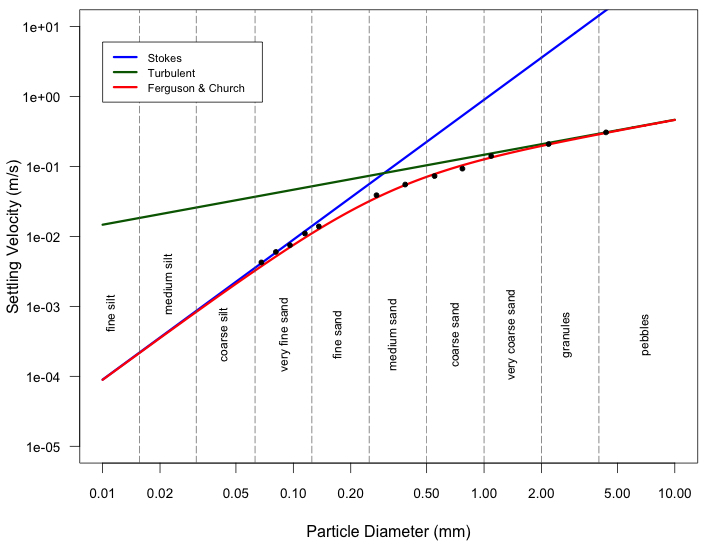 I’ve been working with and thinking a lot about the silt range of grain sizes lately … look for a post in the future focused on that. See all my posts about R here. Thank you, i learn a lot!! Christie … actually, zooming in on the fine end of these relationships was something I was going to tackle next. And when I say ‘next’ I mean hopefully soon. The effective density of similar-sized flocs is, I imagine, highly variable.